With some polish, this could be awesome. 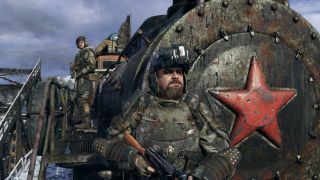 4A Games says Metro Exodus is bigger than Metro 2033 and Metro: Last Light combined. When I load into the wasteland for the first time in our hands-on demo, I can see why. The third game in the series plans to scale Metro up, but can it do so while retaining its identity? Here are some first impressions from a few hours in the snow. The hands-on demo took place in a wintry patch of marshland divided by waterways full of horrible mutants. It's a large space, but it's not a Stalker-scale world. Instead the sandbox areas provide a pace change between more traditional linear sections that the Metro games are famous for. I struck out to explore the zone and quickly found trouble. I took a rowboat onto the river and had to shoot some oily mutant pondlife that tried to eat me. I also encountered a few packs of the gangly wolf-like mutants that will be familiar to Metro players—they roam the wasteland in packs and attack on sight. In one area a flying dragon-like mutant circled overhead. If it spots you it swoops down and tries to pick you up. This happened to me unexpectedly as I was fending off some river mutants. One moment I was trying to land a headshot on a gross eyeless monster, the next I was being pulled up high above the ground. I didn't figure out what had happened until I fatally hit the floor and saw a blur of large flapping wings. One moment I was trying to land a headshot on a gross eyeless monster, the next I was being pulled up high above the ground. For a while I chose to follow the main quest line. The game clearly signals the critical path, so you're able to avoid it if you want to stay put and explore. Metro Exodus tells a linear story, so once you have moved on to a new zone, it's unlikely you will be able to backtrack. The main story led me to a church, where I was trapped by an anti-technology cult and had to shoot my way out. I stealthed the first half of this short level, taking out goons from behind. The stealth systems seem largely unchanged from previous Metro games—you crouch-walk silently and ideally need to stay out of the light to remain hidden. As the bodycount started to rise, the goons' shouts went from intimidating to uncertain, until they were on the verge of a total rout. This section reminded me how good Metro is when it's a focused, directed experience. Out in the open I enjoyed soaking up the bleak, radioactive atmosphere. I crawled into a sunken house and found some resources in a box—this seems to be a big part of the sandbox experience in Metro Exodus, collecting largely ammunition and stuff to sell. There are larger facilities and basements to explore too, but I didn't find any myself. Before our hands-on demo 4A Games showed us part of a mission set in a contaminated underground network of corridors. Last Light featured some terrifying claustrophobic combat encounters in places just like this, and as I watched the player burn away cobwebs with a lighter I was reminded of the horrible spider tunnels of Metro Last Light. 4A Games want to include a more developed story in Metro, which means more NPCs and more standing around listening to dialogue. You're travelling across the wastes in a train, and during the course of the three hours or so I spend exploring the marshes I recruited a couple of new survivors for the team. Your little train will act as a home base of sorts, it seems. It's stalled by an explosion on the tracks at the start of the demo, and the crew lingers around outside and chats. It feels like your changing group of companions will be the focus for Metro Exodus' story, which encompasses a year of your character's life. You play as series hero Artyom once again, and the plot follows on from the 'redemption' ending of Metro: Last Light. When you're exploring you can press a button to open your rucksack and tweak your two guns. It's not new, being able to swap out sights, barrels and ammo clips in the middle of a level, but it's very well done in Metro Exodus and fits perfectly with the series' greasy, improvised guns and gadgets. When you kill an enemy you have the option to swap a gun with theirs, or strip their weapon for parts. I was genuinely excited to find a guy with a decent scope, because it meant I could slap it onto a rifle chassis and use it to scout, and take people out at a distance. When it looked like I was about to get into a big fight I replaced my silenced pistol muzzle with something brutish and short-range. The customisation options feel meaningfully different and they let you build a personalised combat style. In quiet parts of the game you find workbenches that let you customise your weapons further. Guns get steadily muckier as you carry them around, so you will want to give them a clean at a workbench too to keep them firing well. After a couple of hours I completely ran out of bullets while attacking a bandit camp. You are pretty screwed when this happens, so you're gong to want to rummage through a lot of bins to make sure you have enough ammo to make it through a big fight. Metro Exodus has to strike a difficult balance. You need bullets and mask filters to survive, but you need to use bullets and filters to acquire them. In previous Metro games this was less of a problem because you reliably run into lots of human enemies who have lots of bullets, and even the odd shop. In the Exodus wasteland you can run into a lot of horrible animals who don't conveniently drop ammunition. The game wants you to think carefully about how to use your precious resources, but to me the system felt overly restrictive, as though I was being punished for exploring. The Metro games look incredible, especially since 4A released 'Redux' versions. The team has successfully scaled up the game while retaining the intense level of detail we saw in the metro tunnels. The new sandbox areas feature a day/night cycle and dynamic weather systems, so the landscape is always changing beautifully. Bugs are my main worry. You often see errors in preview builds months before a game is released, but they are particularly damaging in a game that relies so heavily on creating a tense atmosphere of survival. NPCs freezing or vanishing into the floor really shatters the illusion. I rescued a guy from some bandits, but when I opened his cage and freed him he stared blankly into the distance and made no move to leave. Maybe he just really loved that prison. The game has been delayed to apply polish, which is encouraging. It would be a shame if technical problems ended up undermining an otherwise such a beautiful, painstakingly detailed world. Metro Exodus is due out on February 22 2019.